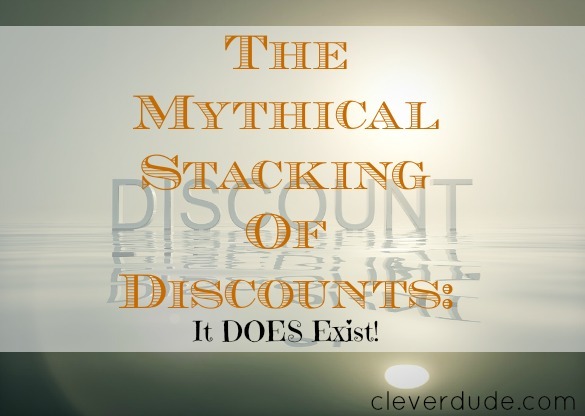 The Mythical Stacking Of Discounts: It DOES Exist! How many times have you turned over a coupon to read this phrase? You sigh, do some math, and figure out which one of the coupons you have gives the best discount. Just once I’d like to be the guy that walks up to a cash register, hands over a wad of coupons and exits the store having gotten something so cheap that it almost seems like stealing. It’s called stacking discounts, and finding a situation where you can do it can prove very difficult. But there is one store where you can pull it off: Kohl’s. I love Kohl’s, even though at regular price their merchandise is horribly overpriced. I’d never pay full price for items at Kohl’s, as discount coupons regularly show up in the mail. The thing I love about Kohl’s is that every now and then the stars align just right allowing shoppers to stack discounts and come away with the deal of the season. I had one of those celestial experiences this weekend. We had $10 in Kohl’s Cash earned from a previous sale (earn $10 Kohl’s Cash for every $50 spent) that we never used. It had actually expired over two months ago. My wife called, talked to a manager, and was able to get him to honor the expired credit. We’ve learned to never throw away expired Kohl’s Cash, as this is not the first time we’ve been allowed to use an expired certificate. I just recently â€œlikedâ€ Kohl’s on Facebook. Last week a coupon was posted on their Facebook page giving $10 off any purchase of kid’s apparel of $25 or more. I normally don’t even think of going to Kohl’s without a 30% coupon, but I made an exception this time due to the uncertainty of how long they would honor the expired Kohl’s Cash, and the expiration date of the online coupon. Once we got to Kohl’s, we found what we were looking for: shorts for my son. We also found that they were already discounted deeply at 60 to 70 percent off. After all the discounts were applied, we paid $6.80 for each pair of shorts that were originally priced $40 each. Admittedly, I do not believe the shorts are worth $40 each, and would never have paid that much for them. But I absolutely believe they’re worth $6.80. They’re good quality, and I’m sure my son will outgrow them before they wear out. Like a perfect storm, several discounts came together so we could get my son some much needed shorts. This kind of discount stacking doesn’t happen to me often, but when it does, I take full advantage of it. Have you ever stacked discounts or do you have any tips to be able to do it more frequently? Wow that’s definitely an awesome deal! @Michelle – It sure was, Michelle…..we didn’t realize just how good until we did the “cost per shorts” calculation on our way to our car and compared it to the regular price. My kind of sale!